A tray of sardines in Costa Mesa, California, in this November 17, 2014 photo. 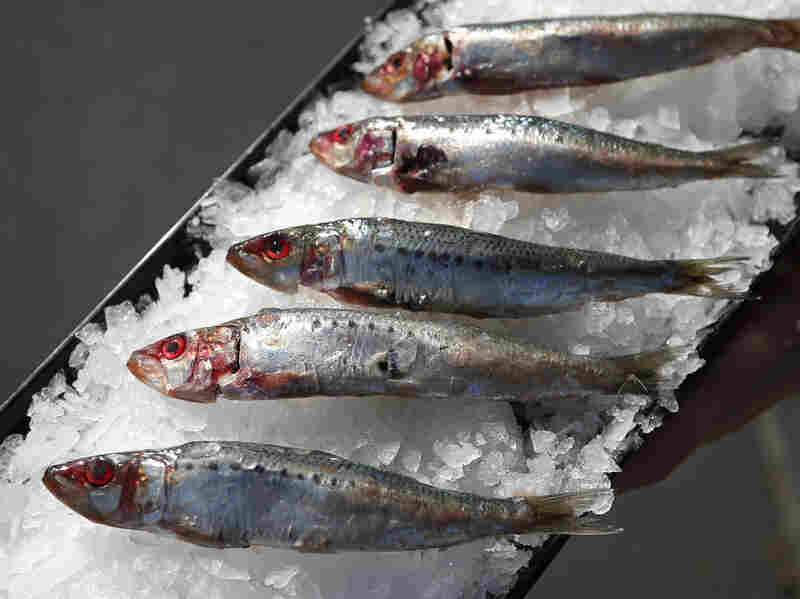 Plummeting sardine populations force a complete ban on sardine fishing off the U.S. West Coast for more than a year. Life has suddenly gotten easier for the sardine. Federal regulators are not only closing the commercial sardine fishing season early in Oregon, Washington and California, but it will stay closed for more than a year. The decision to shut down the sardine harvest is an effort to build up depleted stocks of the small, oily fish. The conservation group, Oceana, says that sardine populations have crashed more than 90 percent since 2007. There are a number of theories about why the fish stocks have collapsed. Oceana says it comes from overfishing. But a report by the Pew Charitable Trusts says the wide swings in the sardine population are normal and usually related to "decades-long shifts in ocean conditions." The report says that although sardines are small individually, they are a key component in the ocean food web. They're considered a crucial forage fish for marine life along the U.S. west coast, and that the collapse in numbers can have a harmful effect on larger animals, including whales, tuna, birds, and seals, which depend on the sardine for sustenance. Oceana says that 90 percent of this year's sea lion pups died of starvation for lack of sardines to eat. The Pacific Fishery Management Council initially decided to shut down the next sardine season for a year, which was due to start July 1st, according to The Associated Press. But after studying the population numbers more closely, the council pushed that date forward, saying the ban on commercial sardine fishing would start immediately. The council recognized the decision could pose financial problems for some fishermen, although most also harvest mackerel, anchovies and squid, according to Reuters. About 100 boats have permits to fish for sardines on the west coast. California's sardine industry was the backdrop for John Steinbeck's classic book, Cannery Row.